You are currently browsing the archive for the Musings category. Last night, 60 or so children and their parents came to the vicarage in search of sweets given in reward for a new stock of terrible jokes! They were dressed in violence and blood, and how I wish we had adopted the American custom of simply bedecking children in fancy dress. But that said, 60 children and their parents came to my door last night. As a Christian, should I have turned them away? A few years ago I would have. The celebration of witches, magic and evil turns my stomach. But is a celebration of evil what is actually going on? I think not. The children come to my door because supermarkets tell them they will get free sweets. The parents let them because pester power and peer pressure is immense. This is no celebration of evil, darkness in opposition to light. This is commercial opportunism. 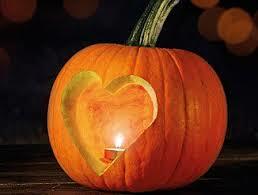 I lit candles, carved love-heart pumpkins, gave a generous welcome and prayed a blessing on the families who came to my door. My prayer for their homes is for sweet love to light their homes with love, that they might in turn offer hospitality to the weakest in our community. This is probably the most useful way I can communicate our Gospel of love and peace in our secular society. When the terrorist attack around Borough Market in London was reported, much was made of the people who chose to run TOWARDS the ensuing chaos, rather than away from it. But these fearless ones said that they were acting on instinct or by training. They denied being heroes but felt they were just supporting people in need. I saw a very small example of the this week, when the BBC were filming in Blockley this week. Someone who house was being used as a location became stressed and angry as the BBC swept way work on a table which was in the way, without noticing that they were causing damage. There was shouting. Then the BBC location manager moved forward, de-escalating the situation by stepping towards the tension. He reacted by instinct, showing empathy and talking without pause, while invading personal space and gently touching the person on the shoulder. It was a master-class in how to dissipate anxiety, anger and conflict. 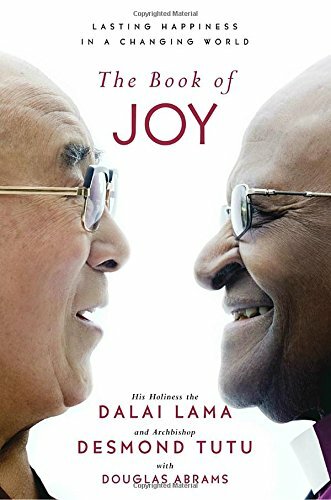 Archbishop Tutu and the Dali Lama’s Book of Joy reminds me that to step towards a difficult situation, even an emotional one like a terrible diagnosis or a bereavement, robs it of its power to terrorize us. By acknowledging our fear and stepping towards a tragic situation, it loses some of its power. I recommend the Book of Joy. We need to celebrate, delight and radiate joy, more and more, in order to live better, freer, more complete lives. Idolatry is easier to spot in hindsight. Back in the days of the Old Testament, it usually involved golden calves and sacred poles. People used to accuse pop stars of becoming idols, and ironically, we have television programmes dedicated to finding new ones. But perhaps the whole point of idols is that they are so deeply embedded in culture that we don’t see them. That is the danger they present – they remain beguilingly hidden in plain sight. Like money, GDPR is not in itself bad. But privacy as it is interpreted by some responsible for implementing GDPR is perhaps just such an idol. Charities, among other organisations that hold data, are struggling to attend to the new legislation with which they must comply in May. GDPR is an expression of the Charter of Fundamental Rights of the European Union that provides a fundamental right to privacy. How that law is implemented is a problem because those responsible for its interpretation and enforcement are at risk of elevating the right to privacy to cultish levels. The law says that in certain situations, for example employers and taxation, there is a need to know some things about us. But purists argue that we must be allowed to control the extent to which others to see through the wall of privacy into our individual private lives. But God created humans to be in relationship with one another. ‘No man is an island’ and the idea of ‘being known’, not least by God themself, is a core element of Christian love for our neighbours and ourselves. When a charity, or a newsletter, or even the vicar, invite me to sign up, they are asking me to be in relationship with their organisation. How can this relationship be initiated and maintained with this degree of control? 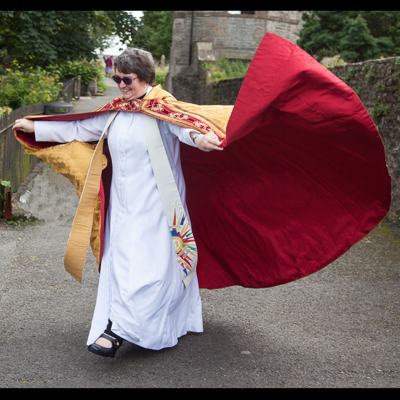 The Church of England says that as vicar, I need to have the consent of every member of the electoral roll before I write to him or her to look at their regular giving – I can preach it but I can’t do direct marketing. Doesn’t that make privacy an idol? So authors are gathering in Cheltenham for the Literary Festival, hoping to entice us into buying their new books. Last night I heard Vince Cable and Stanley Johnson talking about their Brexit novels, and as we left we began to wonder if there is still a place for the political novel in a social media-driven world. Twitt er, Facebook and other social media sites are sources of immediate news, whether personal, local, national and global. They share immediate impressions, un-nuanced emotions and initial responses. Time is needed before news can be weighed and assessed, and most of us don’t use social media in that way. Blogs and editorials allow more scope to reflect on the bigger picture and the better question, but even they do not often have the distance in time and vision to allow for a considered view to develop. It takes time to take in a vista, to look for patterns and themes, to sort the fake news from the actions and trends which are going to affect our lives in the longer term. In fact, I believe it takes novels to bring that task to fruition. Only when we can transport the immediate into a more creative distance, and sort many truthes into THE truth, is it possible to reflect on where we have been, and where we are going. Stories help us to grasp that there are more possibilities beyond what our eyes can see. And in all of that, to find out where God has gone before us, and beckons us to follow. Peter, with his hands the size of dinner plates, hands that had pulled in the nets of fish on the Lake of Galilee; Peter who didn’t make the grade, whose education was curtailed at 12 – he flunked out of synagogue school; Peter, foolish, headstrong, stubborn, a flaky friend who Jesus called by a name into which he would have to grow. Peter who looked up into the sky on the hill of Ascension, hoping for another glimpse, a clue as to what to do next. With heavy heart and slow mind, he turned for Jerusalem, unable to comprehend what and how the future could unfold. Who. filled with the Spirit at Pentecost, stood and preached the sermon of his life, adding 3000 to the followers of the Way of Jesus. Peter who followed the Way all the way to martyrdom, leading what was to become a movement, then a cult, and finally a religion. I visited Rome a few years ago as vice-chair of a Church of England Commission. A red clad cardinal took us to the top of the Pontiff’s palace, and we looked down on the square and the tourists and the pigeons. A student guide took us below the huge monolith that is St Peters Basilica, to the ancient cemetery below, where the great and the good of Nero’s Rome are buried alongside Christian gladiators. In a hidden crypt below the altar of the church above, bones were found wrapped in gold and purple cloth during the hopeless, helpless atrocities of the Second World War. The location, the manner of preservation, the carbon dating, the date of nearby catacombs, suggest these bones may have been Peter’s. In a Perspex box, made by NASA, I looked upon the hand bones of the saint who grasped for the hand of Jesus as he walked on water, as he began to sink through the waves. This man, this hand, had met Jesus, had touched him. It was surprisingly, strangely moving. I brought Peter back from Rome with me as a friend to whom I sometimes talk. Paul, educated, passionate, young, who joined the Way after a blinding encounter with Jesus, and had to re-frame his faith over the making of tents. Paul, courageous, passionate, inarticulate, rushing around the empire getting into Boy’s Own scrapes and scraps, who spoke in letters to each little benefice of congregations, and from whom we glean universal truths. The common thread though each story, journey, testimony is the guiding of the Holy Spirit. Without the Holy Spirit and the ability of Peter and Paul to hear, digest, learn, embody and act on the Spirit’s guidance, we might not ever be here, in this place. Peter learnt of hospitality and inclusion from a sheet of prohibited animals in Joppa, Tel Aviv, and saw beyond that vision to God’s welcome of gentiles, heathen, outsides. He welcomed us, the unclean, to eat as the table of the Lord and king. And Paul, though intent on building up his little churches of artisans in the Middle East, was led by the Holy Spirit into Europe, to our door. Without these fathers of our faith, we would not have heard the Gospel when we did, and as we have. Thanks be to God for them, and all the people of faith who have walked the Way before us. We take up the cross they carried further, deeper, higher into the Kingdom of God and our own calling by the Holy Spirit to live and work and act and serve in this, our generation. At this time of year, the Diocese of Gloucester remembers Oswald, Bishop of Worcester from 963. Oswald was a reformer who wanted more than anything to see monastic communities growing closer to God through prayer, study and discipline, and serving their communities. The desire of his heart is therefore similar to mine, as the current Vicar of Blockley. He established religious communities across the south of England, and then sent monks from those communities to revive and reform other monastic foundations which had grown lax and tired. Legend has it that every morning as part of his prayers, he washed the feet of 12 poor men, and then fed them. Oswald became Bishop of York in 972, while remaining as Bishop of Worcester. He owned the religious community in Blockley, and visited regularly, especially in the summer. We still have a large pool in one of the the local fields known as the Bishop’s Fish Pond. It is a source of great joy to me to imagine Oswald resting, reading, dreaming and praying in the church in which I now preside. We too, over 1,000 years later, seek to grow closer to God and to serve those in our community. “If you are going to be an extra, this is the episode to be in”, mused the director. 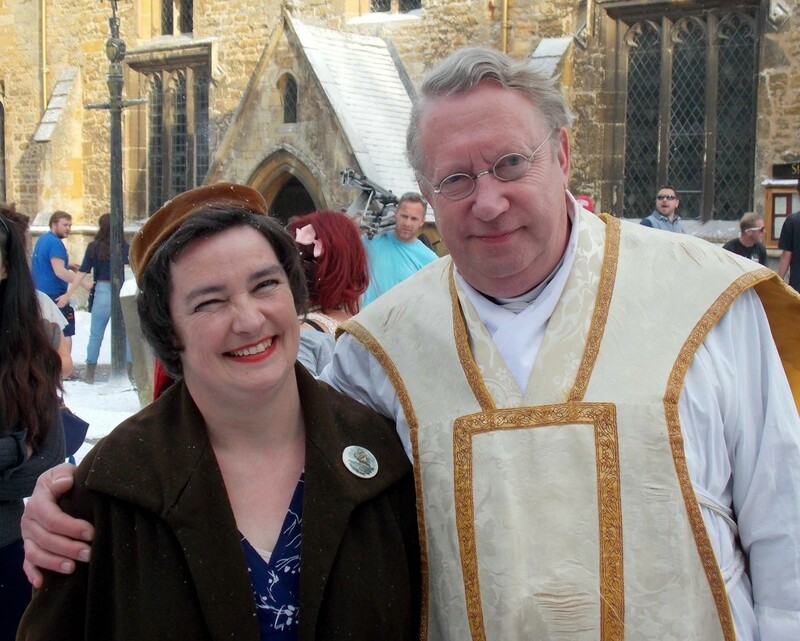 Which is why, at 10:30am on my day off, a BBC person knocked on the door of the Presbytery and told me to hurry down to costume to get ready for filming the Father Brown Christmas Special. I’ve got short, straight hair, so it was fun watching the poor hairdresser trying to get it to curl around the edges of a little brown 1950s cap. Make-up was thankfully kept to a minimum, though the red lippy was rather nice, and then down to costum e to find something that would fit me. I had no idea of the level of detail of the costumes that the actors wear. On the warmest day of May I was kitted out with a genuine 1950s bra and stockings, dress and coat, gloves and scarf, pretty little brooch and shoes. 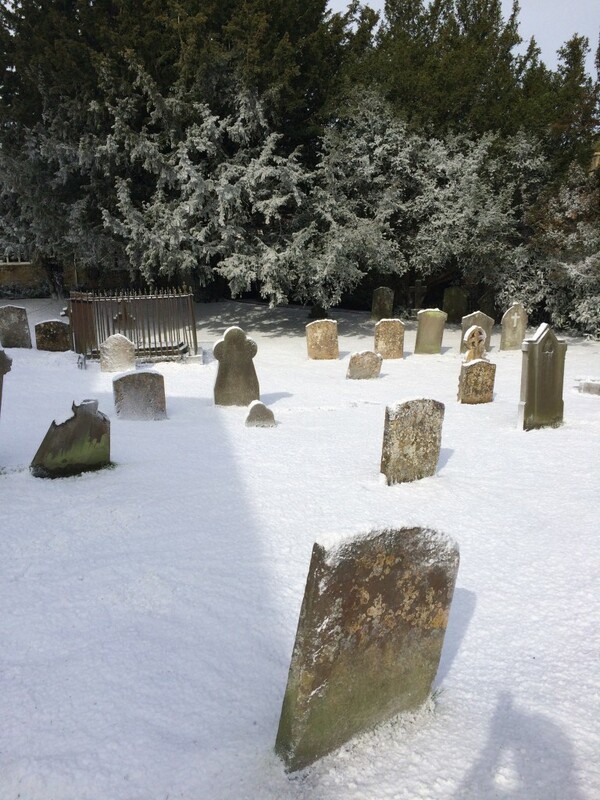 Then up to my church to talk silently to another extra as the main actors of the show led Mary and donkey endlessly up and down the graveyard. The hig h point of the day was hearing Mrs McCarthy tell the director to “Get that SA (support actor) out of my way”, when I got confused about where I was supposed to be going. My parishioners and most of the cast didn’t recognise me in this new role! And the glorious paper snow which looked real and made the whole village turn out and smile. The low point – too much waiting around with nothing to do. And hands sweating inside leather gloves. About 15 years ago, I took part in a fascinating research project at the request of Church House Publishing. With a number of people from the USA, sponsored by Church Publishing Inc, we gathered to dream about the church of the future, and to project potential for growth. We were supposed to be concentrating on all things liturgical (to do with the worship of the church), but as a group of people who were drawn together to dream, we soon broke out of the constraints of liturgy and began to speculate on how and why the church would grow over the next twenty years. We came up with an axis. On the vertical, we put a scale of intimacy with God. On the horizontal, we put a scale of engagement with humanity. It is possible to be close to God but distant from humanity. A church like that would be awesome and beautiful in its worship, but its social engagement would be scant. A church could be the reverse, very socially aware but not very engaged with their relationship with God. In the worse case, a church could be distant from God and from their neighbours. Such a church would almost certainly be in decline, spiritually and actually, closed and inhospitable. But a church that is growing is a church that is highly engaged with its community, generously open, and deeply committed to worship and discipleship. It’s a no-brainer. 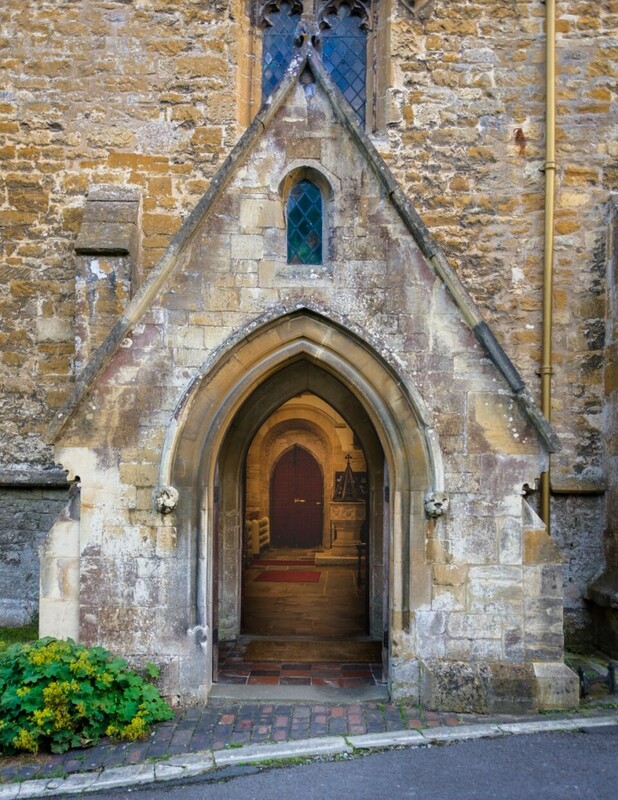 A church which is open to others and open to God is more likely to thrive than a church which is closed. 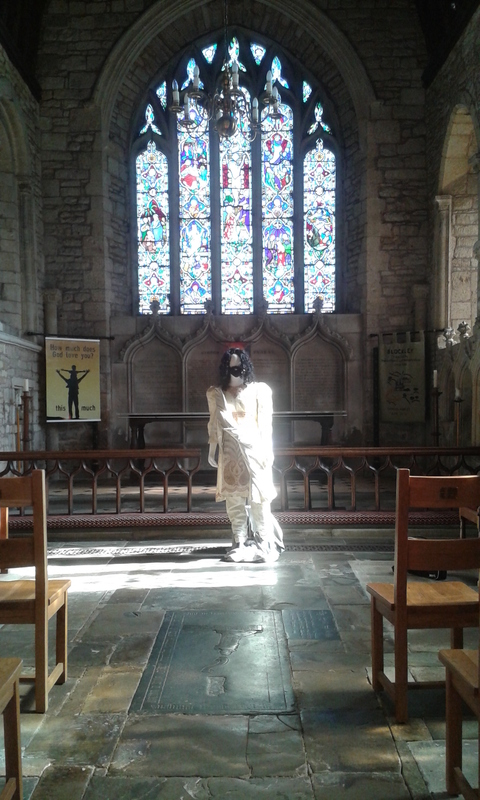 Over Easter, our resident artist lent Jesus to our church. The presence of Jesus is with us all the time, but this was what one of my congregation described as “a Debenhams dummy” dressed in jeans and boots. Through Holy Week and on into Easter, his clothing changed as he stayed with us through this most Holy Week. The reactions to our Jesus were nearly always intense. It was clearly difficult to be ambivalent around him. 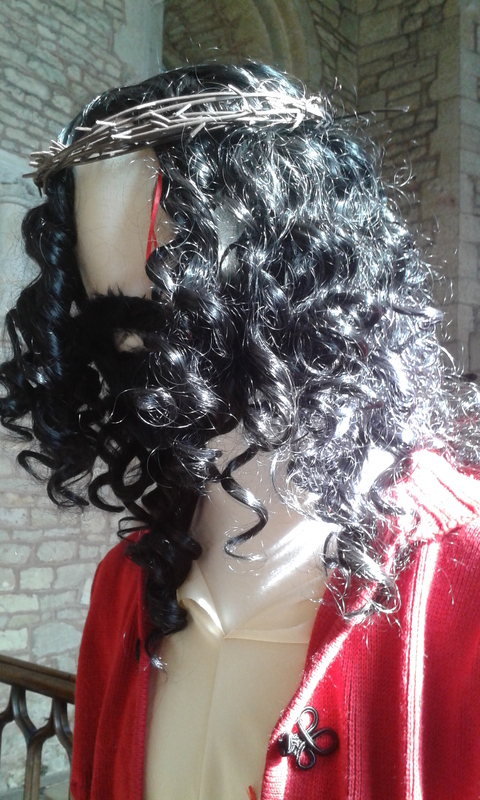 Some hated his lack of facial features, or his very presence. Others found him thought-provoking, a visual symbol of the presence of Christ, accompanying us as we accompanied him through Holy Week. Most of the time, he was in the way, standing by the altar rail, ready to trip the unaware. He was a dark shadow in the church, especially first thing in the morning. I loved having Jesus ‘in the way’ though Holy Week. He was just where and as he should be in our lives at this most precious time when we remember Jesus’ journey to the cross. He was inconveniently present in the temple, at the table, on the journey, until he was with us in the sunshine of Easter. Love him or hate him, Jesus was present to us in more ways than one this Easter. Why so quiet, Dana Delap? No blog since December? Shame on you! Well, it isn’t only post-Christmas recovery that has caused me to embrace inertia. It is also fear. I’m going to Africa for the first time, and I’m scared. I’m scared of the poverty that I will see there; I’m scared of the history of colonialism and of slavery which will be all around me; most of all, I’m scared about how being there will affect me and challenge the comfortable world I live in. I wonder what will have to change because of what I see and hear and feel.